You are here: Home / Giveaway Events / Mirth in A Box Giveaway! US Only Ends 12/3! Mirth in A Box Giveaway! US Only Ends 12/3! Welcome to the Mirth In A Box Giveaway Event, we’ve teamed up with Adventures of 8, Blog with Mom, & Just Married with Coupons and our other blogging friends to bring a lucky winner a Travel Mirth In A Box Bundle prize valued at over $70! This would make a perfect gift item! My relatives that live in Florida would get a kick out of opening a Mirth in A Box and exploring its contents. I bet you could think of someone on your gift list that would enjoy one too! 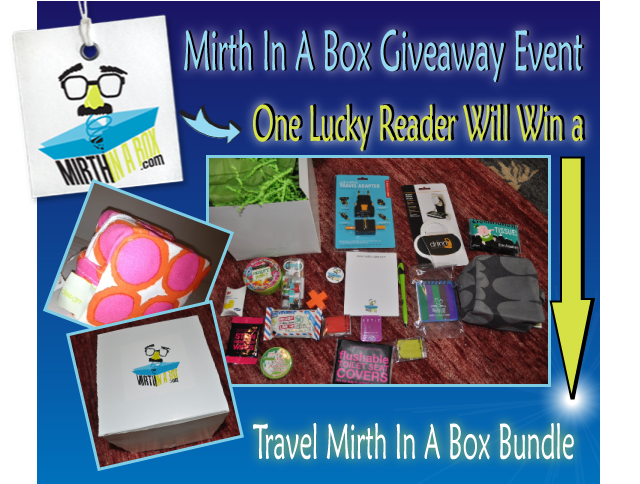 Now what you have been waiting for… MirthInABox.com is sponsoring a giveaway and one lucky winner will receive a Travel Mirth In A Box Bundle similar to the one shown in the picture above.